This 199-room resort with 4 restaurants is located in a sheltered cove on Manzanillo's Isla Navidad, with a private yacht marina and sandy beach nearby. Melaque Condo Near the Beach! Safe, Secure and Modern! Hotel is smaller but new. Rooms are standard size for a hotel. They are well equipped with fridge, microwave and a newer flat screen tv. Only negative thing was internet poor. Had to go in hallway for it to work. Location was great. Could walk to everything. 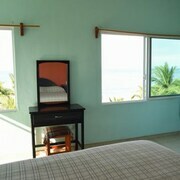 Beach front, clean and next to all restaurants and amenities. Where to find San Patricio Melaque hotels near an airport? 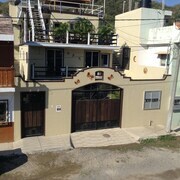 Where can I find hotels in San Patricio Melaque that are near tourist attractions? You will find a number of hotel options to select from when you are arranging your trip to San Patricio Melaque. Right now, Expedia's booking portal lists 13 hotels within a short drive of San Patricio Melaque's downtown area. Convenience is everything when it comes to trouble-free vacationing, so check out the latest offers at the Club Nautico El Dorado and Hotel Bahía, which are located within 1 kilometre (0.6 miles) of San Patricio Melaque's city center. 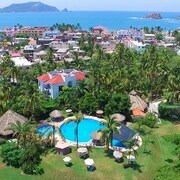 16 kilometres (10 miles) from the middle of San Patricio Melaque, is the Punta Serena All Inclusive - Adults Only. 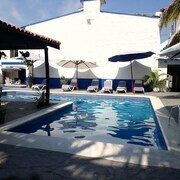 The Los Angeles Locos - All Inclusive is positioned 16 kilometres (10 miles) away. 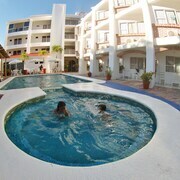 You could also choose to make a booking at the Grand Isla Navidad Resort or the Cabo Blanco Hotel. 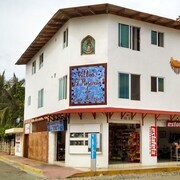 The closest accommodations in South Coast - Costalegre are Cuastecomates and Barra de Navidad. Cuastecomates is 2 kilometres (2 miles) to the west of San Patricio Melaque, while Barra de Navidad is 4 kilometres (2 miles) to the southeast. 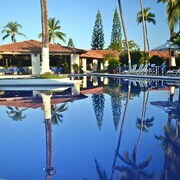 Cuastecomates hotels are the The Alondra Hotel and HOTEL BARRA DE NAVIDAD. 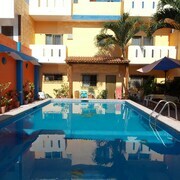 While apartments and hotels are the Trivento Barra de Navidad and Casa Misifus Villas & Spa. Now that you have learnt a little about what hotel options are available in San Patricio Melaque, take the time to visit Expedia's San Patricio Melaque travel guide for the inside scoop on the many scenic and cultural attractions in this part of the world. What are the most popular San Patricio Melaque hotels? Are there hotels in other cities near San Patricio Melaque? 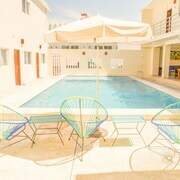 What other types of accommodations are available in San Patricio Melaque? 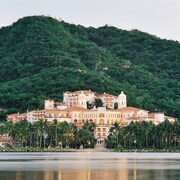 Explore San Patricio Melaque with Expedia.ca’s Travel Guides to find the best flights, cars, holiday packages and more!